H2 as a memory database for Spring-based applications is lightweight, easy to use, and emulates other RDBMS with the help of JPA and Hibernate. Frequently when developing Spring based applications, you will use the H2 in memory database during your development process. Its light, fast, and easy to use. It generally does a great job of emulating other RDBMs which you see more frequently for production use (ie, Oracle, MySQL, Postgres). When developing Spring Applications, its common to use JPA/Hibernate and leverage Hibernate’s schema generation capabilities. With H2, your database is created by Hibernate every time you start the application. Thus, the database is brought up in a known and consistent state. It also allows you to develop and test your JPA mappings. H2 ships with a web based database console, which you can use while your application is under development. It is a convenient way to view the tables created by Hibernate and run queries against the in memory database. 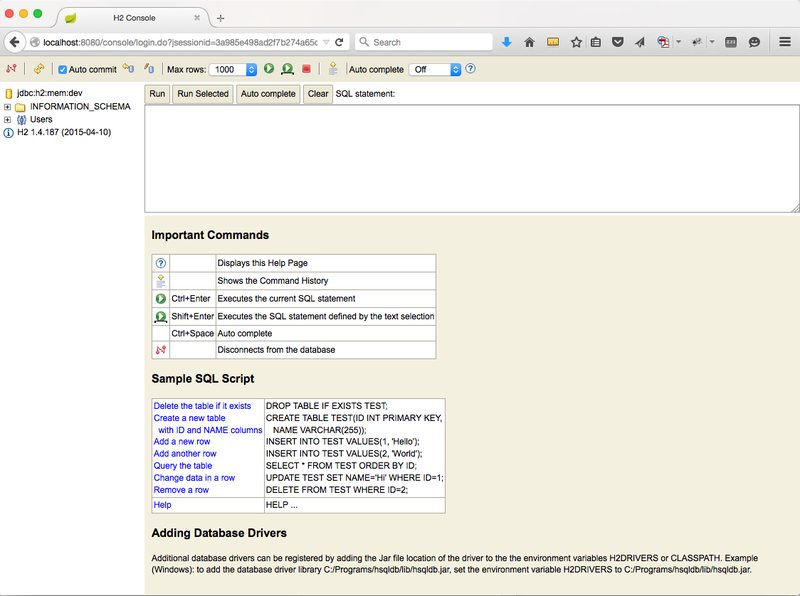 Here is an example of the H2 database console. This setup works great for running our Spring Boot application with the H2 database out of the box, but if want to enable the use of the H2 database console, we’ll need to change the scope of the Maven from runtime, to compile. This is needed to support the changes we need to make to the Spring Boot configuration. Just remove the scope statement and Maven will change to the default of compile. Normally, you’d configure the H2 database in the web.xml file as a servlet, but Spring Boot is going to use an embedded instance of Tomcat, so we don’t have access to the web.xml file. Spring Boot does provide us a mechanism to use for declaring servlets via a Spring Boot ServletRegistrationBean. The following Spring Configuration declares the servlet wrapper for the H2 database console and maps it to the path of /console. Note – Be sure to import the proper WebServlet class (from H2). If you are not using Spring Security with the H2 database console, this is all you need to do. When you run your Spring Boot application, you’ll now be able to access the H2 database console at http://localhost:8080/console. If you’ve enabled Spring Security in your Spring Boot application, you will not be able to access the H2 database console. With its default settings under Spring Boot, Spring Security will block access to H2 database console. Allow all access to the url path /console/*. Disable CRSF (Cross-Site Request Forgery). By default, Spring Security will protect against CRSF attacks. Since the H2 database console runs inside a frame, you need to enable this in in Spring Security. CAUTION: This is not a Spring Security Configuration that you would want to use for a production website. These settings are only to support development of a Spring Boot web application and enable access to the H2 database console. I cannot think of an example where you’d actually want the H2 database console exposed on a production database. Simply start your Spring Boot web application and navigate to the url http://localhost:8080/console and you will see the following logon screen for the H2 database console. Before you login, be sure you have the proper H2 database settings. I had a hard time finding the default values used by Spring Boot, and had to use Hibernate logging to find out what the JDBC Url was being used by Spring Boot. I’ve done a lot of development using the Grails framework. The Grails team added the H2 database console with the release of Grails 2. I quickly fell in love with this feature. Well, maybe not “love”, but it became a feature of Grails I used frequently. When you’re developing an application using Spring / Hibernate (As you are with Grails), you will need to see into the database. 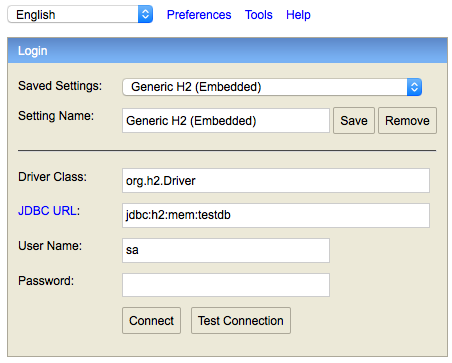 The H2 database console is a great tool to have at your disposal. Maybe we’ll see this as a default option in a future version of Spring Boot. But for now, you’ll need to add the H2 database console yourself. Which you can see isn’t very hard to do.